Just as Family Tree DNA ended its 8th Annual Conference, they announced the start of their annual Year-End Sale. These are some good prices and are available to everyone through December 31st. You don't have to do anything special; there is no code. 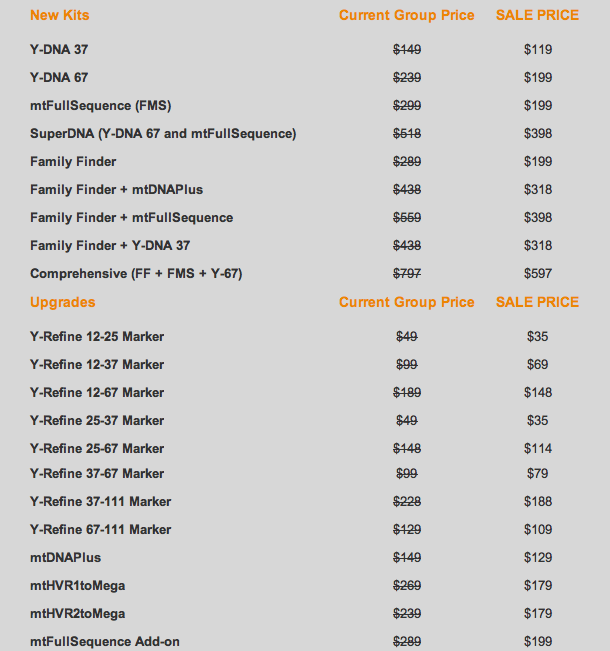 Simply visit ftdna.com, pick out your test and you'll see that it's on sale. As I mentioned in my post about AncestryDNA's new autosomal DNA test, I feel that ftDNA offers a superior product. Currently, the autosomal Family Finder test is $199, the same price as Ancestry.com's non-subscriber price. FtDNA offers you a ton more features that will help you find relatives and allow you to use third party websites to delve deeper into your ethnic analysis. If you were thinking about getting a DNA test from Ancestry, I highly recommend your purchase from ftDNA instead.